The artist in the school residency program is an exciting opportunity for students to see a professional show and also have the opportunity to work with professional performing artists in the classroom for up to 8 sessions per class. We have 4 Performing Arts Residencies to choose from. Our residencies always include every child! Our residencies always include professional performances! Our residencies always end with a school-wide performance! This program is sponsored in part by grants from the Alberta Foundation for the Arts (AFA). Maureen Rooney and Paul Punyi are recipients of the Mayor’s Lifetime Achievement in the Arts Award and have performed and taught theatre for over 30 years, specializing in mime, stage-fight, slapstick, mask, Commedia del Arte, and movement for the actor. Hundreds of Alberta schools have enjoyed a Rooney-Punyi Performing Arts Residency! This exciting and popular residency has been enjoyed by hundreds of schools throughout Alberta! This is a fun, fast-paced introduction to many different styles of Physical Theatre/Mime: (pantomime, graphics, tableau, and black box). 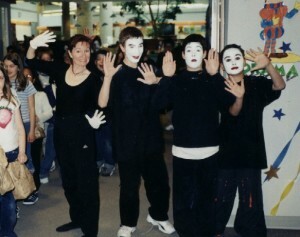 Grades K-3 create a new mime piece and storybook play during each session while parents watch their young performers in action. 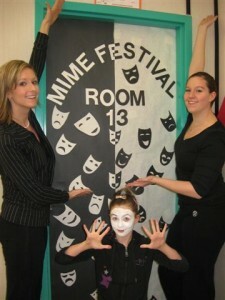 Each class of Grades 4-9 gets 5-7 sessions to create 3 group pieces for an exciting mime festival. 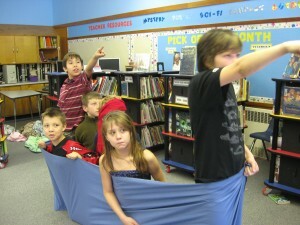 Students and teachers love this fun approach to physical theatre! This residency ends with a school-wide physical theatre festival that parents love! Schools often receive 50-75% funding for residencies from Alberta Foundation for the Arts. The teachers who attended our sessions at a number of Alberta Teacher’s Conventions asked that these fun games and exercises be brought together as a residency! So here it is! Language Arts Improvisation Residency is a fun, introduction to acting and improvisation. Each class gets 5-6 sessions. Each session has been designed to enhance the language arts curriculum, allowing students to practice listening comprehension, storytelling, and presentation skills in a fun, non-threatening atmosphere. How do I find and fill in the holes in my story? How do I take my story from interesting to entertaining? What’s my character thinking? Am I good at telling my story in sequence? These skills are taught through theatre games that are hand picked or created by us! This residency ends with a school-wide Improv Festival where laughter fills the hallways and parents have a blast joining in the fun! This exciting residency takes students through the same process that professional playwrights go through when work-shopping their plays. 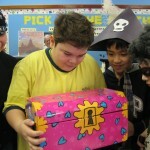 Students are introduced to ways of creating characters and dialogue through the use of improvisation. Grades 4 – 9 work with student written stories or hand-picked storybooks. Grade 3 work with popular children’s stories. 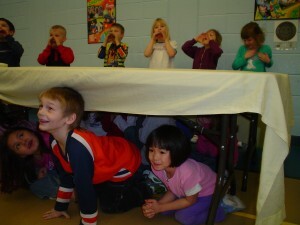 Grades K – 2 act out a different story every session. Reading and writing is fun when you combine it with theatre! The journey from the page to the stage is a fabulous learning experience for both students and teachers. This residency ends with older students performing their very own mini-plays for younger grades and parents. This residency starts with the hilarious “Power-Up” show about alternative energy! 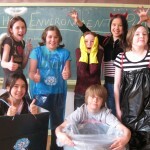 (Grades K-6) The residency is a great way to get excited about cleaning up and protecting our planet. Grades 4-6 get 8-10 sessions to create short scenes that are skilfully put together into a show that is performed for parents and younger grades. Using character acting, personification, and simple costuming, students work in small groups to help create a play with a great message. Grades K-3 are audience for the play AND they get one session where they get to act out “The Lorax” for parents to enjoy. This residency ends with older students performing their very own play for younger grades and parents. Kick off your Artist in Residence with a Reading Show! · The sessions take place during noon-hour for one week. · Parents do not have to drive their child to this educational enrichment as it is held right in the school during school hours. 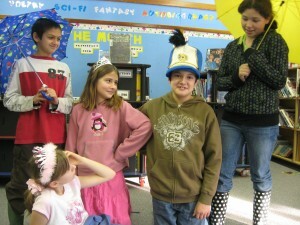 · To introduce acting and performing skills as a tie in to language arts. · To introduce one way of bringing written material to life. · To practice listening comprehension skills. · To work on creating character and dialogue through improvisation. 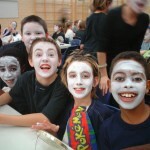 · To provide the opportunity for students to socialize and develop friendships with children outside their grade level. I loved our performing arts residency with Rooney and Punyi! These two are excellent! At first I was a reluctant teacher thinking this would be a waste of precious teaching time. I soon realized the benefits of having my class participate when I saw the class co-operate and interact with eachother in a friendly non-threatening manner while creating their own theatre pieces, and all the while curriculum was being covered! This was such a positive experience. I would recommend this for all elementary schools. The students at Clara Tyner School were thrilled with the activities that Rooney prepared for them. Rooney made students feel confident in their abilities in a safe and secure environment where they could try new things. All students eagerly participated in all activities. Teachers and parents commented on Rooney’s excellent management skills and her ability to get maximum participation from all students. Teachers were impressed that Rooney was able to maximize students’ special skills that were not always evident in a regular classroom setting. Many links to the curriculum, including writing in Language Arts and Character Development were evident. Rooney was masterful at taking students from guided work to independent work where their creative abilities could then take over. 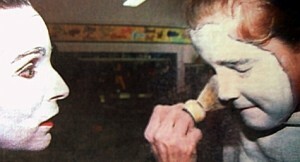 Rooney provided excellent modeling in the areas of Drama and Character Development. Vanier Community Catholic Schoolin Edson has developed an excellent relationship with Maureen and Paul. Our students look forward to their performances and residencies. They are talented, generous individuals who are skilled at creating inclusive environments where all students are encouraged to participate. Our teachers recognize their boundless energy and enthusiasm—and professionalism. I loved having my grade 6 students participate in the Rooney and Punyi artist in residence program. Along with the children, I learned many strategies that will help me in my daily teaching. For example, they always taught the kids to “tableau “starting with the climax or the most important event in their story, Next , the kids were told to have 2-3 events leading up to the climax and 2-3 after. This is an effective strategy for teaching the children how to retell a story without getting bogged down in telling EVERY detail from the beginning of a story and then running out of time or energy for the rest. All the children really grasped this concept and then we used it in our “book-talks” in class. Also, the children learned how to read a “mime” or “tableau” by asking pertinent questions to ensure that the kids were acting with specific details. Another very effective strategy for grouping students to debrief or share after a lesson was presented. The kids still ( 6 weeks later ) ask to form groups of three – six in our daily work in the classroom. Overall, I loved the seeing the kids be so successful in their skits etc due to the excellent instruction they received from Rooney and Punyi. Many of their ideas can be used across the curriculum. Our partner artists were exceptionally well prepared, interacted with the students in a way that was both dynamic and informative. The artists challenged our students to stretch their learning beyond their current abilities and grow as learners. We are excited about continuing the performing arts residency with Rooney and Punyi Productions for next school year. Teachers learned so many techniques that they could use in their classrooms. Students loved working with Rooney. She had them enthusiastic and engaged throughout the residency. Rooney’s personality makes the residency work so well. She is vibrant, enthusiastic and professional.